Summer is coming. Along with lighter clothing and days beside the water, the necessity for shaving returns. Imagine never having to shave again. Wouldn’t that make life easier? Laser hair removal is a great way to simplify your life. No more ingrown hairs, no more razor cuts, no more hassle. 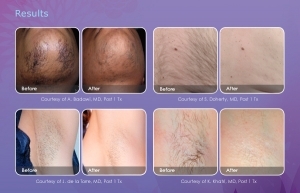 Laser hair removal takes several treatments. Why? The only hairs that are permanently stopped from growing are the ones in the early growth phase. At any given time, our hairs are in all different stages of growth (early, middle and late growth phases) so you will need to be treated a few times to catch the early growth phase of different hairs. The number of treatments varies depending on the equipment used. Laser hair removal does not work for fair or grey hair. This treatment depends on the hair follicle containing pigment that will absorb the laser light. The light turns into heat when it is absorbed and the heat inactivates the cells that support the hair follicle. If you don’t have enough pigment in your hair follicles, the treatment will not work. Scientists are working on modifications that will allow the treatment to work on fair and grey hair but we aren’t there yet. If you are treating an area that has a mixture of dark and grey hairs, the dark hairs will go, leaving behind the grey. Laser hair removal is not a comfortable treatment. There is a heat component and a sting component to each flash, like being snapped by a hot elastic band. If you can tolerate a tattoo, you can tolerate this. And we blow cold air on the skin which helps a lot. I DO NOT recommend using a numbing cream if you are treating large areas. Numbing creams can be absorbed from the skin and cause side effects. There is a case of a young woman who was going for laser hair removal of her legs. She slathered EMLA all over her legs and wrapped them in cling film before she drove to the clinic. She died on the way there from an abnormal heart rhythm caused by the lidocaine in the EMLA. For some hair removal lasers, you cannot have a tan or a darker skin tone. This means that you could be turned away when you go in for a treatment, or worse, treated when you shouldn’t be, resulting in burns. We have seen many people treated at other clinics with laser burns. Cheaper is definitely not better. Both the equipment and the technicians may be of lesser quality at the low-priced laser salon. Lower-priced salons may not invest as much time and money into training their staff and they often overload their staff with treatments, so the chance of mistakes being made is higher. At Advanced Rejuvenation, we have the very high quality Cynosure Elite+ laser. This laser delivers great results and is safe for every colour of skin, including tanned skin. We are seeing better results with 4 treatments with the Elite+ than we were seeing with 6 treatments on our old IPL system. Our staff have advanced training in laser safety and laser use, and they were not allowed to treat clients until they had proven they were ready. Hair may regrow years after successful laser hair removal. This is usually associated with a change in hormones, such as pregnancy, menopause or some medical conditions. We have had success retreating after the change in hormones has settled again. Having unwanted hair is a hassle and may have a negative impact on self-image and self-esteem. Laser hair removal is a great treatment that can be life-changing. However, I strongly recommend that you do your due diligence and find a medical spa with excellent equipment and highly trained staff before you proceed. Advanced Rejuvenation offers women and men a diverse range of treatments with the latest medical scientific technology for anti-aging, body sculpting, skin care, and hair restoration at our 1,200 sq ft clinic facility in downtown Burlington, Ontario.